Miami is perhaps the epicenter of architectural parking garage design, hosting work from Herzog & de Meuron, Frank Gehry, Enrique Norten, OMA, Arquitectonica, IwamotoScott, Leong Leong, John Baldessari, a scrapped Zaha Hadid proposal, and more. Adding to the mix is a seven-story mixed-use structure integrating retail with an 800-car capacity garage. 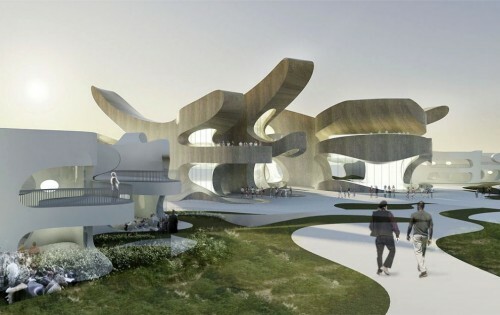 "Ant Farm" by WORKac celebrates social interaction, sustainability, art, music and landscape. In an ant colony-inspired structure, the public spaces and connecting circulation appear and disappear behind a perforated metal screen, resembling an ant farm of public activity while providing visual contrast, shade, and protection. "XOX (Hugs and Kisses)" by J.MAYER.H. 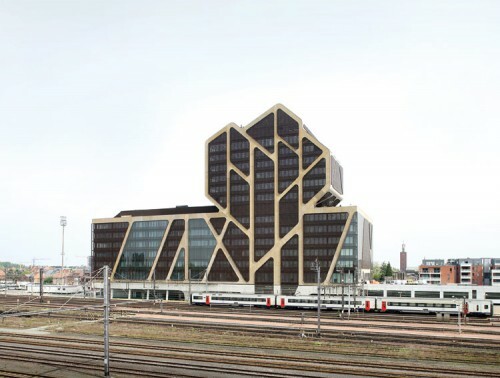 : appears as gigantic interlocking puzzle pieces that nestle at the corner with the forms of WORKac's façade. 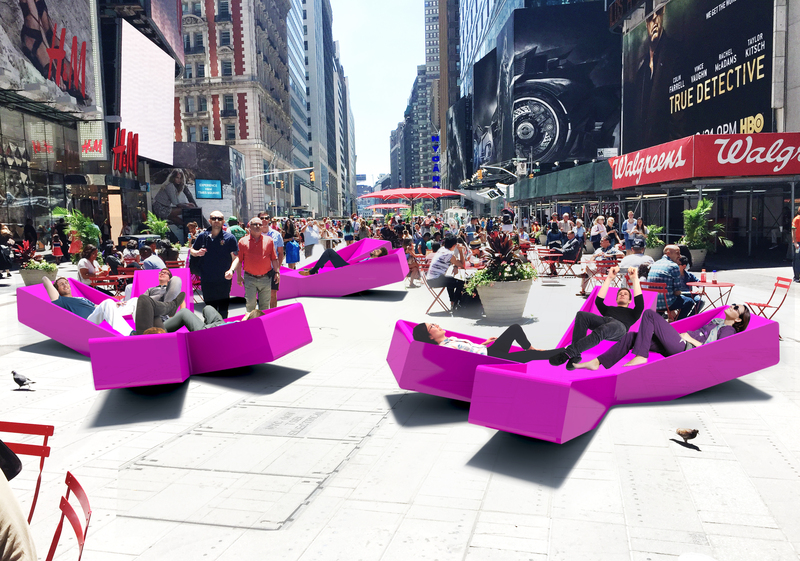 "XOX"'s enigmatic forms, emblazoned with striping and bright colors, recall the aerodynamic forms of automotive design and appear to float above the sidewalk below. Smaller volumes, covered in metal screens project outward and are activated with embedded light at night. "Serious Play" by Nicolas Buffe: serves as the entrance and exit to the garage. It is constructed with a dark perforated metal backdrop. 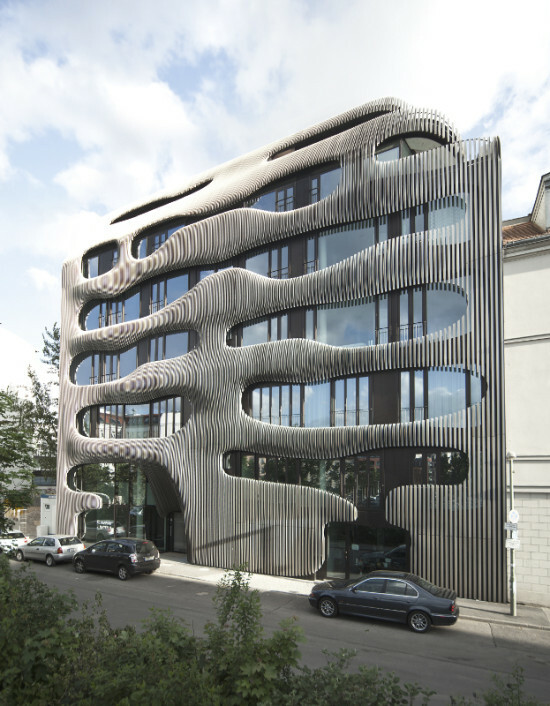 The façade features a variety of diverse 2D and 3D elements crafted from laser-cut metals and fiber resin plastic. "Urban Jam" by Clavel Arquitectos: draws from the rebirth of urban life in the Miami Design District - where old structures and discarded spaces have been revived by architectural and urban designs. Urban Jam suggests a similar "repurposing" of very familiar elements, using 45 gravity-defying car bodies rendered in metallic gold and silver. "Barricades" by K/R: inspired by Miami's automotive landscape; particularly it's ubiquitous orange- and white-striped traffic barriers. In this case, the faux-barriers are turned right side up and form a brightly colored screen. The façade has fifteen "windows" framed in mirror stainless steel, through which concrete planters pop out above the sidewalk. 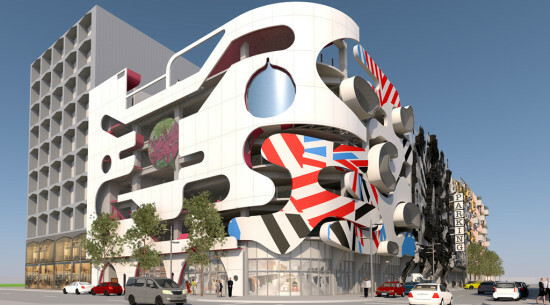 Following over two years of planning and construction, the Miami Design District is opening the long-awaited Museum Garage. The eclectic complex is located just two blocks from IwamatoScott’s City View Garage, another high design parking facility in the multi-acre retail and cultural neighborhood. 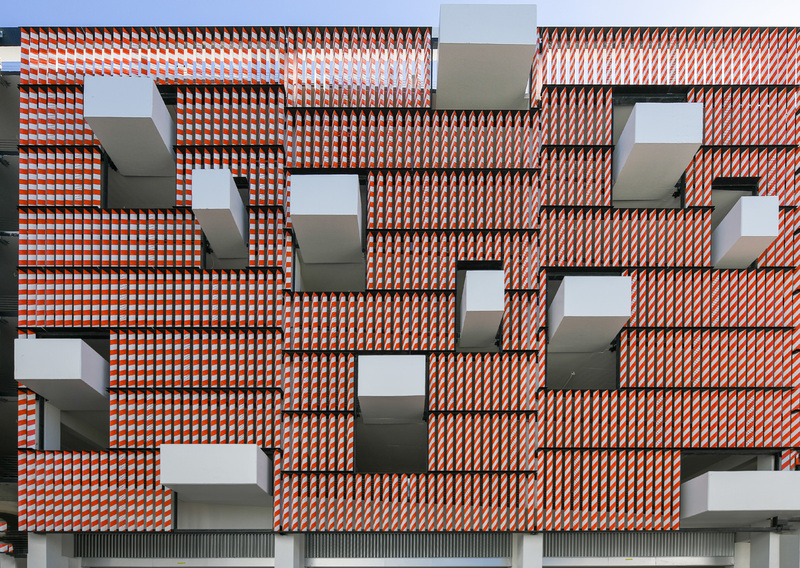 The garage’s animated, wildly varied facades are designed by five architecture and design firms: WORKac, J. Mayer H., Clavel Arquitectos, Nicolas Buffe and Keenan/Riley. 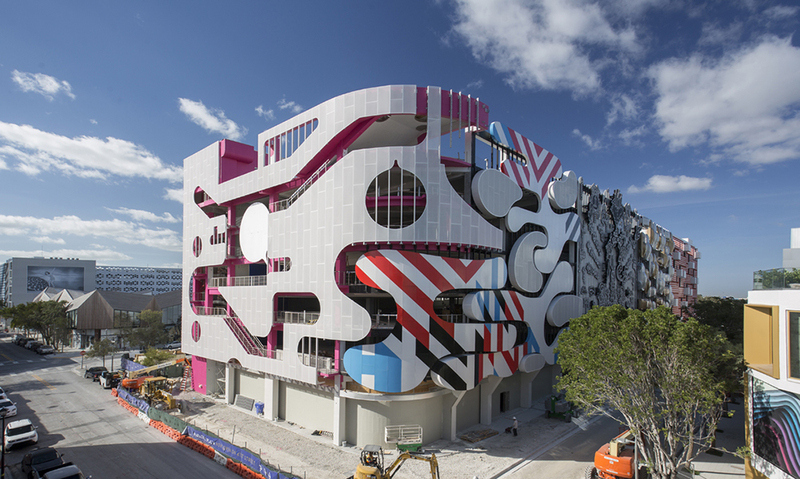 Located on the northern border of the Miami Design District, the 800-car-capacity Museum Garage is seven stories tall, rising from a ground floor entirely devoted to retail. Terence Riley, of Keenan/Riley, led the concept of the ambitious project, which drew from Exquisite Corpse, a surrealist parlor game that entails the collaging of images by different authors independent of each other's designs. In the spirit of the game, each firm designed an individual and radically different facade as disparate and unconnected pieces, creating a multifaceted tapestry for the utilitarian structure. Emphasizing the cultural purposes of Museum Garage and the Miami Design District as a whole, each facade is titled as a standalone curatorial work. Ant Farm, WORKac’s contribution to the project, is inspired by the maze-like layout of an ant colony, replete with circulation corridors that are obscured by a perforated metal screen. The bends and folds of the elevation are habitable spaces, public spheres provided with shade and protection from Miami's subtropical environment. J. Mayer. H, a Berlin-based firm, designed XOX (Hugs and Kisses), which is composed of large puzzle pieces adorned with stripes and bright colors. Nicolas Buffe’s contribution, Serious Play, features a diverse range of 2-D and 3-D details formed from plastic and laser-cut metals. Buffe mixes historicist elements such as 23-foot-tall caryatids with cartoonish graphics. Urban Jam by Spanish-firm Clavel Arquitectos is dominated by forty-five gold and silver car bodies that cling to the elevation. Stacked atop each other, the cars are made to resemble a vertical traffic jam. Keenan/Riley’s Barricades draws upon common orange and white traffic barriers to create a brightly colored screen wall that is studded with fifteen windows framed with stainless steel. British firm Speirs + Major designed custom lighting for each façade, highlighting diverse architectural elements across the graduated and uneven elevations. Ribbons of laser-cut metal lamellas envelop a glass curtain wall. Facade Installer Rupert App GmbH+Co. A small, twisting airport in Mestia, a medieval town in the Democratic Republic of Georgia manages to capture the essence of the UNESCO World Heritage Site's ancient stone defensive towers while still standing on its own as a skyward-reaching modern structure. 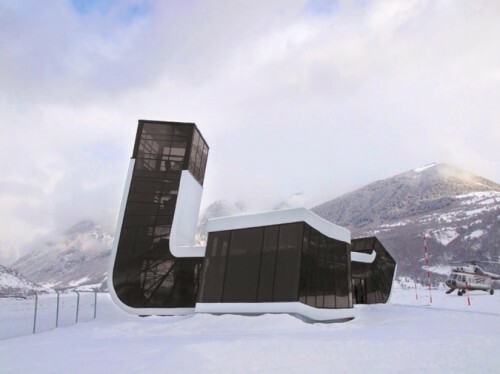 Designed by German firm J. Mayer H. Architects, the airport is expected to boost tourism in the historic town and nearby ski resort. Amazingly, the structure was designed and built within three months between October and December 2010.